We offer the following goat cheeses at Goatsbeard Farm: Fresh Rounds, Fresh Tubs, Soft-Ripened Cheese, Feta and Aged Raw Milk Cheese. 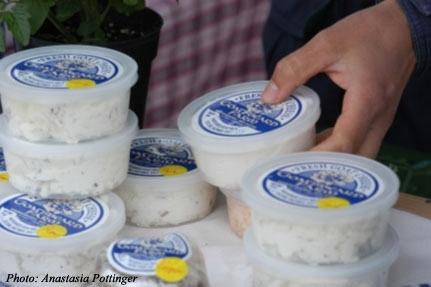 The following fresh cheeses are all made from pasteurized goat milk, culture, enzymes and salt. Missouri Moon: An aged cheese made from pasteurized milk in the style of France's famous Camembert. Rounds available in two sizes: the 7 oz. Missouri Moon ($9.00) and the 3.5 oz. Mini Moon ($6.50). Goatsbeard Farm also makes aged cheeses from raw goat’s milk, culture, enzymes and salt. All of these cheeses are aged a minimum of 60 days, some much longer. Note: Retail prices quoted above apply to Farmers' Market sales and on-farm sales. Please contact us to obtain wholesale prices.